Ge.tt is one of the easiest and fastest real-time online file publishing services that you can find. Not only that you can upload and manage your files by using only your browser (no additional software is needed), but everyone with a account gets 2GB of storage space for FREE! Ge.tt can handle every file type you upload to it. 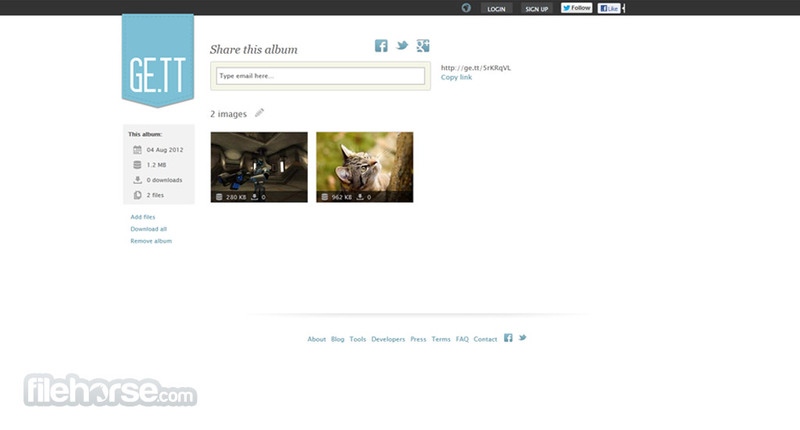 Music, videos and images can be shared instantly and your work files can be accessed by your co-workers or clients. All that will make your life easier and work more productive. No matter if you are computer novice or seasoned professional, Ge.tt is a service that anyone can use. Share files with your friends and family with style and freedom! Sharing of files on the internet has become one of the most commonly things people do with their time today, but to do so they often had to use several separate online services that were unintuitive, slow, complicated, less secure and more importantly, they wasted precious time. To combat all of those problems, developers of web application Ge.tt have managed to create all in one destination for sharing files quickly and painlessly. This is achieved by adapting the workflow to the new age where you don’t have to personally oversee uploading process. That way, your only concern needs to be what files you want to share and who to receive it. Established in November of 2010 in Copenhagen by the team that was less than 5 people strong, this site managed to expand its popularity very quickly, managing to enter into top 4000 most visited sites in the world. Now, encouraged by the sharp increase in user traffic and spreading of good reviews, Ge.tt team aims to even more improve their web application and even more widen the gap between them and other popular share sites like Dropbox, Rapidshare, Mega and others. What is the main feature of Ge.tt that brings this amount of improvement of user experience you may ask? The answer is the reduction of time you are involved in the process of file sharing. This is accomplished by ingenious simplification. All that you need to do to share any type of file or group of files is to select that file, and then simply choose which of your friends will receive it. You don’t need to wait for download to be finished, and that really helps you save the time and move to other things, especially if you upload speed is not great. After just a few minutes with Ge.tt you will come to realize that you really don’t have to waste your time with other file sharing sites, and that is a feeling that can be rarely found these days. When you arrive on Ge.tt you will be greeted with really simple and modern looking design that is easy to understand and take control over. As soon as you start uploading file, you will be transported to the page that has tools for sharing – you can manually enter the email address of the recipient, or you can share that file with one press of a button to Facebook, Twitter and Google+. Please take note that before your decide to go with the share action, you can still manipulate what will be shared, you can add more files or remove a few. In any case, you don’t really need to wait for all uploads to be finished. As soon as upload is started you can activate sharing plan, and when upload is done only then will Ge.tt automatically send sharing message away across the internet. If you have elected to create your own account, then you will be able to see record of all files you have shared, manipulate them and share them again if you want to. Ge.tt will never require of you to pay for account creation and you will be able to use it as long as you like if 2GB of online storage is enough for you. If you really like Ge.tt and basic free storage of 2 GB become too restrictive for your sharing, you can elect to pay $5 per month for 5GB storage, $10 per month for 40 GB and $20 per month for 100 GB. All these premium subscriptions also eliminate ads. Only few years ago we would not be able to imagine that service as easy and as streamlined as Ge.tt could be possible to exist, but now, millions of users visit it every day to share their data like never before. Try it out now! 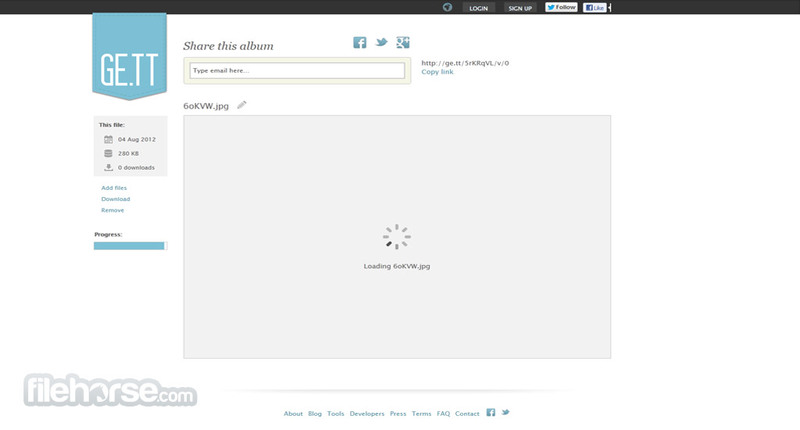 Your files are ready to be published or shared as soon as you select them! No need to wait for files to upload. 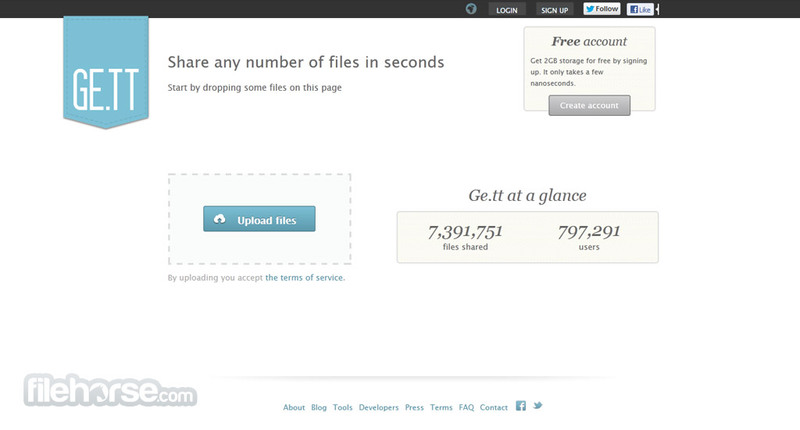 You can easily track how many people have downloaded or viewed your files. Ge.tt is 100% web-based and works directly in your browser. No flash required. No applet needed. No installation before you're ready to go. Just go to your browser and start sharing. With Ge.tt you can send the shared files on an email directly from the website. If you sign up, the recipient can see it's coming from you.